Firmware is the read-only memory (ROM) in the computers and other electronic devices. 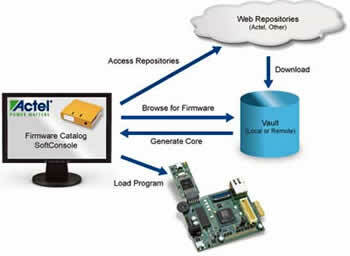 In computing, a firmware is a software program or set of instructions programmed on a hardware device. Generally speaking, it refers to the programs that help a device do what it’s supposed to do; it’s the background programming that runs the machine. The firmware chips are rewritable. It is the heart of almost every popular digital device. The firmware could be updated very easily that would be extremely beneficial. This became possible with flash memory chips. The devices that use firmware are portable audio players, cell phones, digital cameras, personal digital assistants and gaming consoles. When you shop for electronic items, you should take note that if the chip can be flashed. The products are usually advertised as being upgradeable. Firmware was originally intended for high level software and could be changed without having to exchange the hardware for a newer device. It also holds the basic instructions for hardware devices that make them operative. Without firmware, a hardware device would be useless. Low Level Firmware: This is found in ROM, OTP/PROM and PLA structures. Low level firmware is often read-only memory and cannot be changed or updated. It is sometimes referred to as hardware. High Level Firmware: This is used in flash memory for updates that is often considered as software. Subsystems: These have their own fixed microcode embedded in flash chips, CPUs and LCD units. A subsystem is usually considered part of the hardware device as well as high level firmware.